Putting Smart is all about reducing the potential for error. There are four suggestions for learning to putt with the percentages in your favour. It is all about putting smart in such a way that everything in your Setup and Stroke helps rather than hinders your ability to make a good putt. Why make putting more difficult than it is? There is no one right way to putt just as there is no one wrong way to putt. However, there are smarter ways to putt. Effective putting is all about reducing the number of potential errors and compensations - and maximising your chances of success. Because there is no right way to putt, you can make any putting method succeed if you are prepared to work at it. However, most recreational golfers don't have the time or the motivation to spend endless hours perfecting their method. Better then to adopt a method that requires the least amount of maintenance. 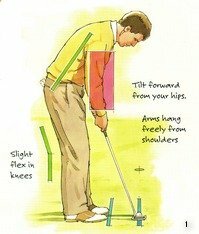 In your setup you want to adopt a relaxed posture with enough tilt from your hips to allow your arms to hang naturally under your shoulders (see illustration above). This will help to promote a free swing of your putter. If your putter is too long for you, you will be forced to bunch your elbows up into your rib cage so that you can get your eyes over the ball. This can block your arms. You want to avoid any contorted or twisted position as if you were in a badly-fitted suit. Next you should hold your putter loosely enough so that someone could easily pull it out of your hands. If your grip pressure is too tight, tension will radiate into your arms and shoulders. There are a number of different stances from open to square to closed. All of then have been successfully used by professional golfers. However, the more the line of your shoulders deviates from a line parallel to your aimline (target line), the more difficult it will be to square your putter at the point of impact. A square stance is less error-prone. Putting is a gentle activity which requires a minimum of motion. The ideal is to keep your head steady with your eyes focused on one spot while avoiding any lower body movement. The only moving part should be the triangle that is formed by your shoulders, arms and hands. This should work as an integrated unit. A common mistake in putting dumb is chasing the ball with your eyes as you make your stroke. In the full swing this is known as looking up. When you do this, you pull your shoulders off-line left at the critical moment when your putter meets the ball. The smart way is to hold your follow-through and listen rather than look. It is almost impossible to improve your putting without practice. However, if your putting method is based on sound fundamentals, your chances of success are better than if your putting method is flawed from the start. The trick is to learn to putt with the percentages in your favour.